Analog Artist Digital World: Grand Opening for Art on Orange! 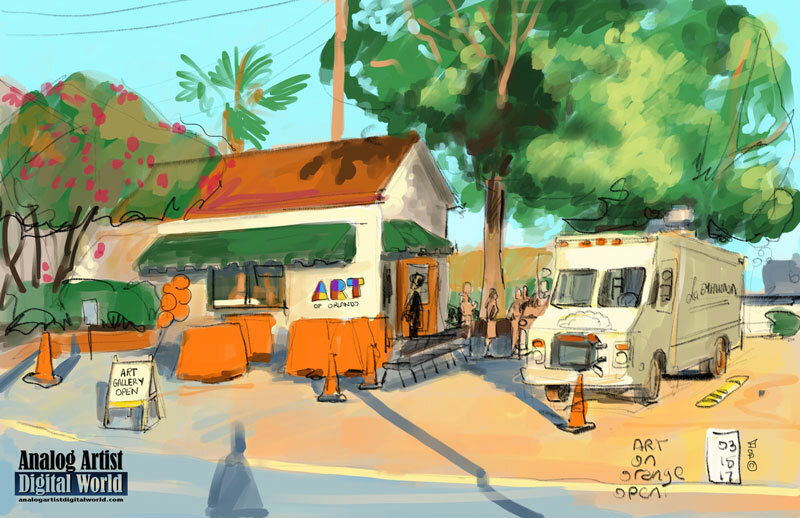 ART on Orange (1211 North Orange Ave, Orlando, Florida 32804) had its Grand Opening Day on March 15th. People stopped by, signed the guest book, browsed the open studio and gallery featuring artist Ginae Lee Scott. The artists original artwork is be available for decor, art collectors and gifts in original canvas, prints and Giclee canvas. You can stop by and meet the artist as she paints in her studio. Also available at Art On Orange, is Rob Bacon Jewelry. It was a cool evening, with a brisk breeze. The gallery itself was constantly crowded and thus warm and cozy with the buzz of conversations. The La Empanada food truck was outside offering dinner options. The great thing about this intimate studio was the view from the front window which overlooks Lake Virginia. I sat across the street to take in the overall view of the gallery. Behind me the sun set behind the lake warning the scene with the warm light of the golden hour. I adjusted colors constantly as I chased the light. Tables were arranged so people could stand outside and chat as they ate dinner or had drinks, which were free. After the sketch was done, joined in at a table where artists were gathered. We discussed an incredibly detailed masters thesis project, and laughed about how it might be simplified. Then the conversation turned to the romance of the streets of Paris. The gallery will be open from 10-5pm on most days. Check the website for hours.